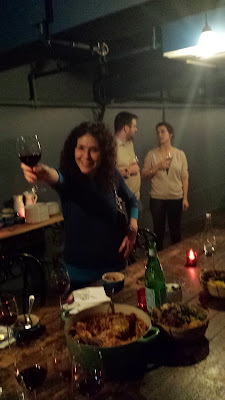 Ariane Daguin presides over judges' table at "The First Annual Cassoulet War." Photo courtesy of D'Artagnan. IT is a perfect night for a food fight, with only snow on the ground and freezing temps to whet the appetite – that is until now. And what a marvelous idea from the great culinary mind of Ariane Daguin, co-founder of D'Artagnan, purveyor of all things charcuterie! An idea that has given fashion writers and editors an excuse to break away from the bazaar that is Day 5 of the Mercedes-Benz Fashion Week New York Fall 2014 shows . Simply and sublimely, AD asked (challenged? ?, dared??) 10 top New York chefs – Benoit's Philippe Bertineau among them – to prepare their interpretation of Cassoulet, the classic French bean casserole and food of peasants. This edict?? 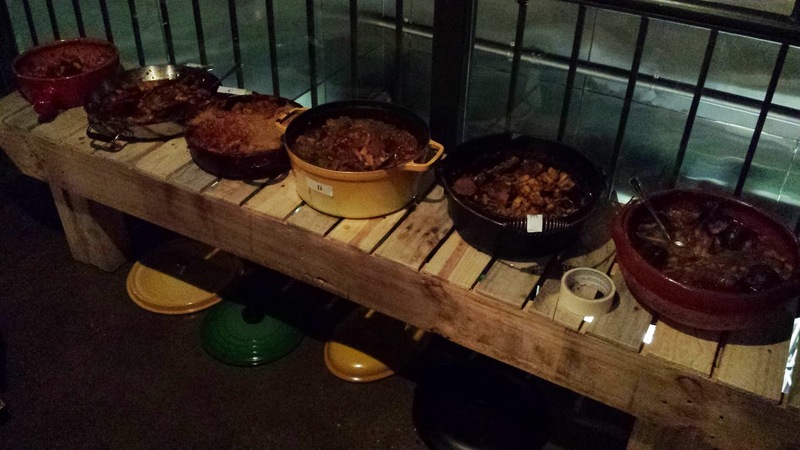 has set off the so-called First Annual Cassoulet War. 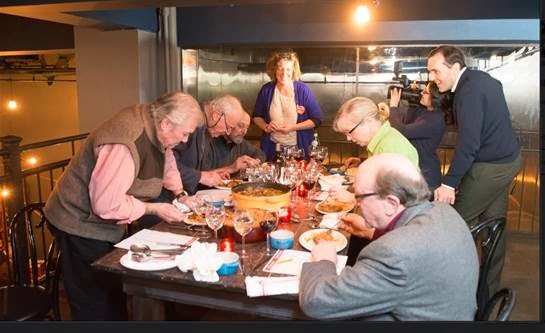 The campaign is being prosecuted at Ocabanon – cave a magner, confronting with the daunting prospect of sussing out a winner among equals, a panel of culinary luminaries, as well as a bevy of local food and wine aficionados. Winners Alex Guarnaschelli and Hugue Dufour hold the spoils of war as the defeated (except Ariane Daguin) smile, even if it hurts. Photo courtesy of D'Artagnan. In attendance are living legends Jacques Pépin and Andre Soltner. We (not Yours Truly, but the Wolfster and his posse) recall being tossed out of the legendary Lutece by AS for sending back a piece of fish which we deemed to be overcooked. Anyhow, the heavy-lifting involved in handling cassoles overflowing with the dish du jour and some pretty exotic takes on it, if troops do not warn those doing the dishing against grand portions, induces a powerful thirst. Quenchers take the form of several reds from France and elsewhere, plus a couple of beers. Highly recommended for digestion after this bacchanal is a pair of armagnacs (Chateau de Laubade, VSOP and Chateau de Laubade, Blanche Armagnac). We particularly enjoy the Domaine Monte de Luz, Tannat Reserva (2007) – from of all places Uruguay. This rugged red stands up well to the hearty comfort dish. And the winners of the “First Annual Cassoulet War”? Cassoulet No. 5 or Butter's Alex Guarnaschelli takes home the “People’s Choice” award for her Smoked Sorano Bean Cassoulet. Hugue Dufour's No. 4 Cassoulet du Loup takes the Judges Choice prize for M. Wells Steakhouse. And what do the authors of this article think of some the cassoulets? Read on. Cottage&Gardens Publications wine & spirits columnist Baroness Sheri de Borchgrave gives the Domaine Monte de Luz, Tannat Reserva 2007 a testdrive. Photo by Yours Truly. Embellished with fennel and other stuff – granted good – but could have done without all of the extra fixings. Deliciously traditional with duck legs, sausage and confit at its heart. The most traditional and tasty. The one that most captures the simplicity of the dish. It is also the one for which I voted because it most reminds me of living in France. There, it was one of my favorite dishes. Competent; tender duck; beans underseasoned. Too salty, but tender meat; carrots are a nice touch. Particularly enjoyable, and featuring a toothsome tomato relish, duck skin and peppercorns. Some of the dishes that chefs sent to the battlefield. Photo by Yours Truly. Nice. Like the added touch of crisp duck skin and tomato relish, which take it to a different (good) place. An unorthodox take on the dish that includes oxtail, black beans, collard greens and rice. With oxtails (yum); spicy; nicely balanced by something I can't put my palate on. Served with rice and black beans. Good, but it is not cassoulet. Another nontraditional version, which is seafood-based, boasting scallops and fish fillets in a mildly underseasoned base. With scallops; so-so; not very seasoned. Needs the oomph of more seasoning. 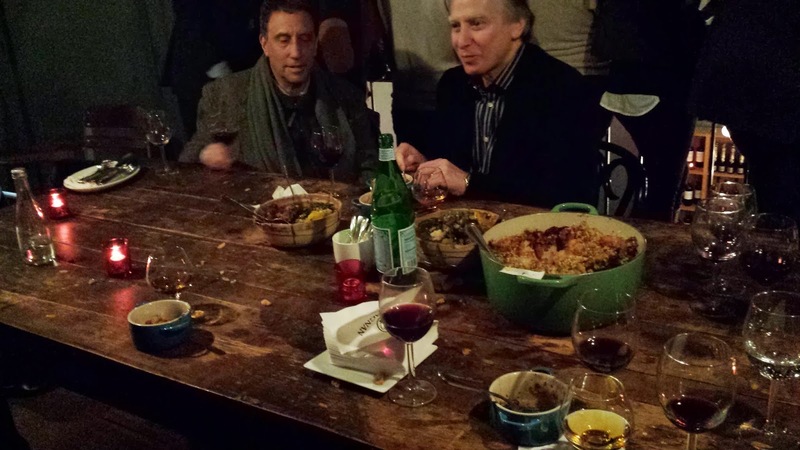 Ian Shapolsky (right) of the Anita Shapolsky Gallery & A.S. Art Foundation, shadowed by Neil Wolfson, quit a dinner with his mother to witness the cassoulet war firsthand. Photo by Yours Truly. Least favorite; very traditional but meat is overcooked; lacking in flavor. The “First Annual Cassoulet War” is an unqualified victory and hopefully will continue for years to come.